John Bibby worked as a ship broker and an iron merchant in Liverpool, before he set up in business properly as a shipowner, with his partner John Highfield, in 1807. Napoleon was causing havoc in Europe, the Americans had won their war of independence, and Liverpool was just beginning to exert its influence as a port. By the time he died, murdered in a mysterious attack when he was 65, John Bibby was a wealthy and influential man, with many properties, a sizable fleet and a thriving metals business. The year John Bibby died, in 1840, Samuel Cunard began his first transatlantic sailings from Liverpool to America; the next 60 years saw a tremendous growth in power of Liverpool as a world class trading port – and John Bibby’s sons and grandsons took his business into the golden age of steam, with a fleet of liners sailing to Burma and Ceylon as well as to the Mediterranean and Arabia. 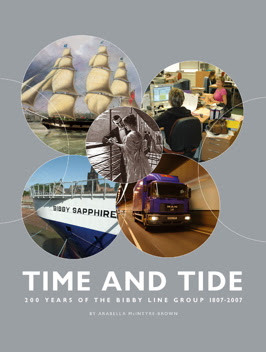 The Bibby Line then endured through two world wars, the worldwide depression of the 1930s, and the transformation of the shipping industry in the 1960s and 1970s. Where many other shipping lines foundered, and others left Liverpool, the Bibby Line survived and evolved, with one of the founder’s direct descendants always at the helm of the business. The 1980s brought big changes for the Bibby Line, with diversification into logistics and financial services, although with shipping still at its core. In 2007, Bibby Line celebrates its bicentenary, with the sixth generation of the family at the head of 4,000 employees worldwide, with a positive future ahead for this remarkable family business. Since we produced the last edition of the company’s history in 1990 there have been some radical changes, not just in our business, but in the industries in which we operate and, for that matter, the world at large. Liverpool, the home of our company for 200 years, has seen a dramatic turnaround in its fortunes – to such an extent that not only is it now a World Heritage site but is European Capital of Culture in 2008. It was my father who wrote the introduction for the last book; his death in 2002 was, I need hardly say, a difficult time for our family; but for the business with which he had been so strongly identified for so long, it was a blow, and he is much missed. The changes he had put in train have given new impetus to the Group and I believe he would have been pleased with the growth of the newer divisions, and with the continued strength of the marine business. In 1990 the internet was unheard of – now work has changed almost beyond recognition and the world has shrunk to the length of a fibre optic cable. At least in some ways. In others, business hasn’t changed since John Bibby founded the company two centuries ago. It is still people who matter: the working relationships within the company and with customers, clients, suppliers and partners. Technology lets us reach further and move faster, but we do business with people, and there’s no substitute for a smile and a handshake. This book reflects the changes to our business – it doesn’t just look back at our past, but shows a snapshot of our present and may even hint at possible futures. But I’ve refused to make any predictions – weather is notoriously unpredictable, be it at sea or in business: the only thing we can be certain of is that everything is subject to change. Well, almost everything. Human nature remains pretty constant: most of us want much the same things, when you come right down to it. When it comes to work, by and large we all want to make a decent living, but as important are liking the people we work with, being respected, being given credit for achievement, doing something worthwhile and feel we’re making a difference. All of this shines through the words of the 17 people featured in chapter three – whatever the job they do. I do believe that remaining a family business has been of huge importance for the Bibby Line Group; the continuity through six generations means a great deal to me, and I hope it creates something of a family feeling amongst our 4,000 people around the world. The business would be nothing without our people. I hope this book demonstrates my immense gratitude and appreciation for the contribution made by every member of the extended Bibby family, in every corner of the globe. I look forward to our third century and the changes and challenges we will meet together. I am very proud to have been part of the Bibby Line Group, as the wife of Sir Derek for over 40 years and now the head of the family shareholding. When I married into the Bibby family I soon realised that I was part of a much larger family than just kith and kin. In those days Bibby Line had about nine ships, most of them passenger liners to Ceylon and Burma; I got to know all the office staff and many of the ships’ captains. But since then the world has changed enormously. Famous shipping names disappeared from Liverpool – Cunard, Blue Funnel and many others; Liverpool itself has seen decades of turmoil and change – but Bibby’s hung on, stayed in Liverpool, and grew into an international concern. Over the years I have seen first my father in law, and then my husband at the helm of the shipping line; and now my son – the sixth generation of Bibbys in the role – is steering the much bigger and broader business. Our worldwide family has reached its bicentenary, and in this book it’s good that we have not just a further edition of the history, but meet people throughout the company, showing the diversity and international interests of this fascinating business from a very personal viewpoint. This has always been a people business, and we have always placed great value and trust in the staff to do their best; this has built up a culture and reputation for trust, honesty and integrity which is so important for our customers and partners. The difference between a true family business, run by succeeding generations of Bibbys, is very striking compared to the impersonal corporate culture of a plc. It is rare these days to keep such a business not only in family ownership, but actively managed by family members, and it is a distinction that we prize highly. My family is very proud to have seen the company through to its 200th anniversary, and we are proud to be taking it into the future in such a strong position. I would love to think that the extended Bibby family will still be here and in good heart another 200 years on. From its origins as a shipping company, The Bibby Line Group has seen 200 years of ebb and flow, evolution, opportunities and innovation. Diversifying into an global player with a distribution arm, financial services operation and marine business, this is a portrait of the company – its operations, its people, and its past – in 2007, as the Bibby Line Group enters its third century.